Home / Blog / The Pelvic Floor — We all have them, so why do we ignore them? 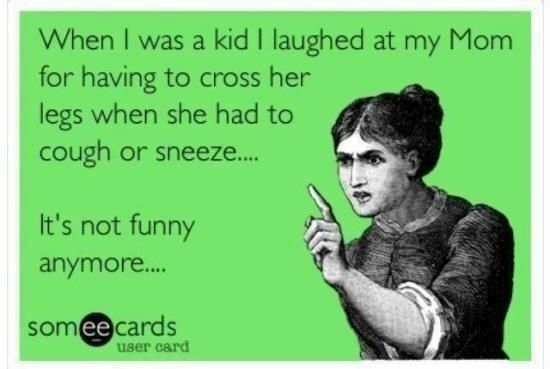 How many of us can relate to a little leakage following a sneeze or a cough, while jumping on the trampoline, or running after our littles? We joke about it with our mom friends. Somewhere along the line I’m sure you’ve heard it’s just a “normal” part of having children. Like the sleepless nights, overwhelming fatigue, and just overall chaos that is now your life after children, a little urinary leakage may seem normal. I am here today to tell you that while it is common following pregnancy and childbirth, it is by no means normal and there may be help out there for you in the form of physical therapy. If you are experiencing any leakage of urine, stool or gas with exercise, laughing, coughing, etc. please read on to see how physical therapy may be able to help you change your life for the better. At this point you are probably thinking: “How can a Physical Therapist help?” Pelvic floor physical therapy addresses the issues listed above, commonly referred to as pelvic floor dysfunction. There are many reasons pelvic floor dysfunction may exist. The two most common sources of dysfunction include weakness of the pelvic floor muscles, resulting in incontinence; or tension/spasms of the pelvic floor muscles, which may lead to pain and incontinence. Millions of women and men suffer from pelvic floor dysfunction. Pregnancy, childbirth, chronic constipation, chronic coughing, surgery, trauma and aging can cause pelvic floor muscle tension, incoordination and weakness. I keep talking about the pelvic floor, but what is the pelvic floor? The pelvic floor consists of three layers of muscles. It acts like a hammock extending from the tailbone to the pubic bone and it is responsible for housing the reproductive organs, bladder, and colon, as well as preventing leakage of urine and stool. The most important thing to note about the pelvic floor muscles is that they are under voluntary control. Just as it is possible to improve the strength of the muscles of the arms or legs, it is also possible to strengthen the muscles of the pelvic floor. The most common way to strengthen the pelvic floor is by performing a contraction of the pelvic floor muscles, more commonly known as a Kegel. The only problem with this is that most people do not know how to properly perform a contraction of the pelvic floor musculature. This is where a specially-trained Physical Therapist can help. Because the pelvic floor is a group of muscles that are under voluntary control, a Physical Therapist who has special training in treating the pelvic floor, is the perfect person to aid in the functional strengthening of this group of muscles. In addition to incontinence being related to muscles with too little tone, there are also different types of incontinence including stress, urge and frequency. There are different techniques to treat each type of incontinence. A Physical Therapist is able to identify the different types of incontinence the patient is suffering with, teach a patient how to manage their symptoms, teach a patient how to properly perform a contraction of the pelvic floor muscles, and progress those exercises at the appropriate time. It is important to remember that the problem is not always weakness of the pelvic floor. The second group of patients suffering with pelvic floor dysfunction may have musculature that has too much tone or scarring secondary to child birth. These patients need therapy to prepare the muscles and surrounding tissues for the ability to properly contract. These treatments may also include work to enable musculature that has too much tone to work at its best. Now that you’ve made it this far, is physical therapy something you think you could benefit from? As I mentioned at the beginning, these things can be difficult to talk about, but I want to reiterate that at Complete Physical Therapy, you are in the hands of professionals who have been specially trained to perform these techniques. You will have a safe place to talk about these tough topics. After meeting with a Physical Therapist, we will come up with a plan that best suits you and your life. These techniques will be explained to you after being evaluated by our specially-trained Physical Therapists. Each patient will be evaluated on an individual case-by-case basis and a treatment plan will be developed for each patient. If you’re ready to tackle this pesky problem or have questions regarding the process, please don’t hesitate to contact our specially-trained therapists, Stefanie Urbom, PT, DPT, CLT-LANA, ACSM-CCET or Renee Dominy, PT, DPT, ACSM-CCET, at Complete Physical Therapy 402.483.0006. We take such good care of our kiddos, now is the time to take care of ourselves. What are you waiting for? This entry was posted in Blog, Renee Blog, Stef Blog. Bookmark the permalink.